Late last year I was approached by the lovely Jo Keeling Editor of Pretty Nostalgic Magazine to write an article about collecting vintage costume jewellery, I was absolutely delighted as you can imagine. As part of the article I interviewed five other collectors about their own fabulous collections and styled the accompanying photoshoot. I used pieces of glass and textiles from my own private stash of vintage treasures alongside these stunning vintage inspired apothecary jars from Borrowed Blue Boutique which I draped in an array of pretty pastel coloured vintage costume jewellery, all available from Passionate About Vintage. I chose the gorgeous roses for the shoot from local florist Lotty’s Flowers and photographer Samantha Jones captured all the fabulous details. 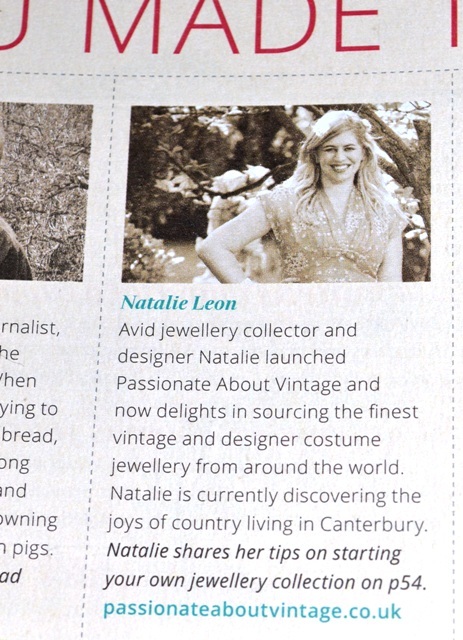 Here is my profile from the magazine contributors page, I’m wearing my absolute favourite vintage dress. I was so thrilled to see the article in print when the magazine came out. To read the article in full, pick up a copy Issue 5 of Pretty Nostalgic Magazine and flick to page 54. It’s out now and available to buy from WHSmith, or you can order it direct from Pretty Nostalgic themselves. I hope you enjoy it! What a lovely way to start the year! 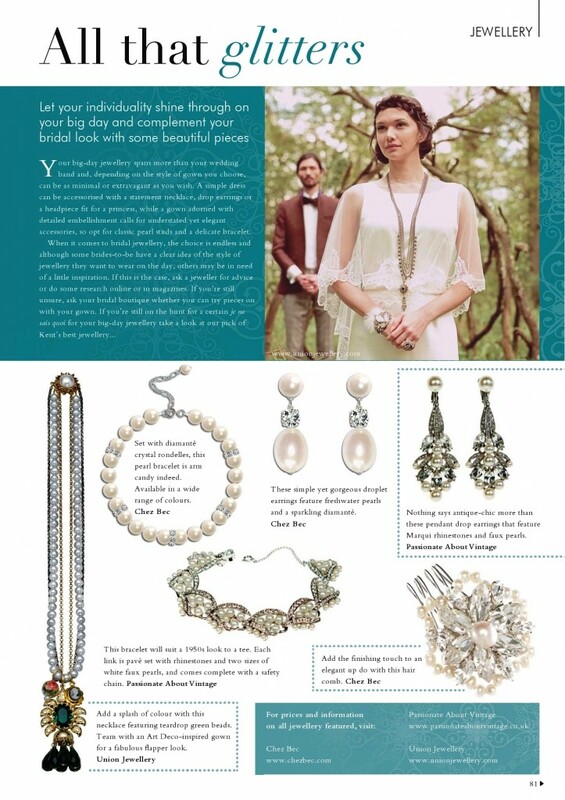 We were recently featured in the January/February 2013 issue of the lovely Your Kent Wedding Magazine. 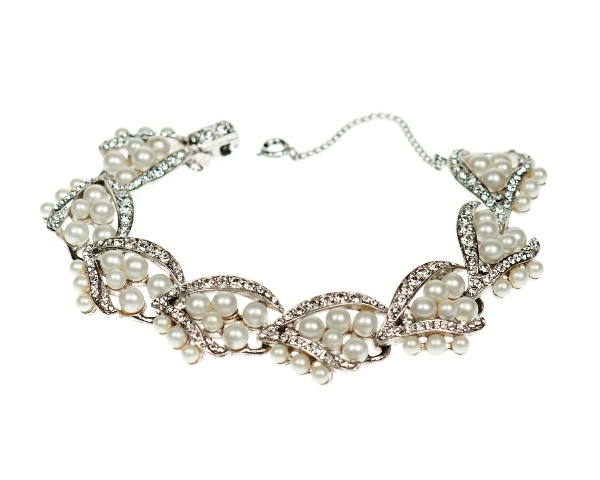 And our Vintage 1950′s Kramer Rhinestone & Pearl Bracelet £150. I have been fascinated by celluloid since my Great Uncle Harry gave me my first piece when I was a child. It was delicate, lace like and heart shaped and I have kept it always. My personal collection now includes; celluloid buckles, brooches, bangles and fans to name just a few. Those who know me are used to seeing me with at least one bangle permanently on my wrist. Celluloid (cellulose nitrate) is considered to be the first thermoplastic, which can be moulded while it is hot and hardens as it cools. It is made from nitric acid, cellulose and camphor. It was highly flammable and quickly decomposed. It was invented by American John W. Hyatt in 1868 as an Ivory substitute. Imitation Ivory celluloid is sometimes referred to as “French Ivory” or “Ivorine” two of its trademarked names. The first examples of celluloid jewellery were made in 1875 by the Celluloid Novelty Company in Newark, New York. They included traditional Victorian Leit motifs which were very realistically moulded such as; cameos, black celluloid mourning jewellery, realistically modelled animals and hands holding fans or roses. A lot of the celluloid you will encounter comes from Japan, who became the market leaders in its production. Japanese celluloid has a slightly waxy appearance and is intricately detailed incorporating recurring motifs of flowers such as Chrysanthemums, Roses, Daises and Peonies. 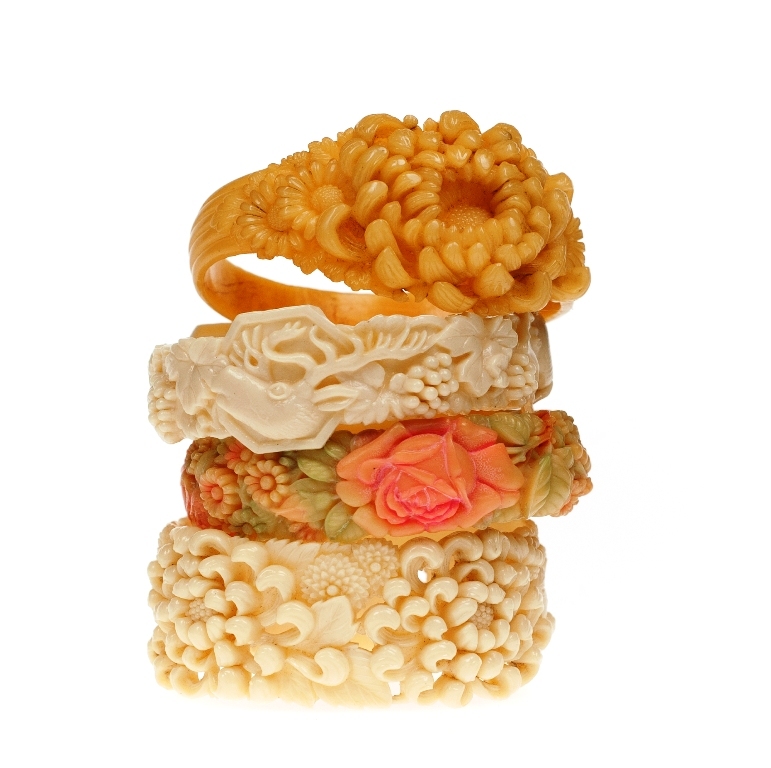 Each bangle is made out of strips of moulded plastic, which was then hand finished, achieving the look of carved Ivory or Coral. Some of these pieces were then delicately hand painted or glazed with a pearlescent coating. When you look at a celluloid bangle you can tell its age by looking for the join. In the earlier examples from the 1930’s the join is always vertical and often a little messy where the strip of plastic has been joined end to end. In later 1950’s examples the join is horizontal and the moulding is less detailed. 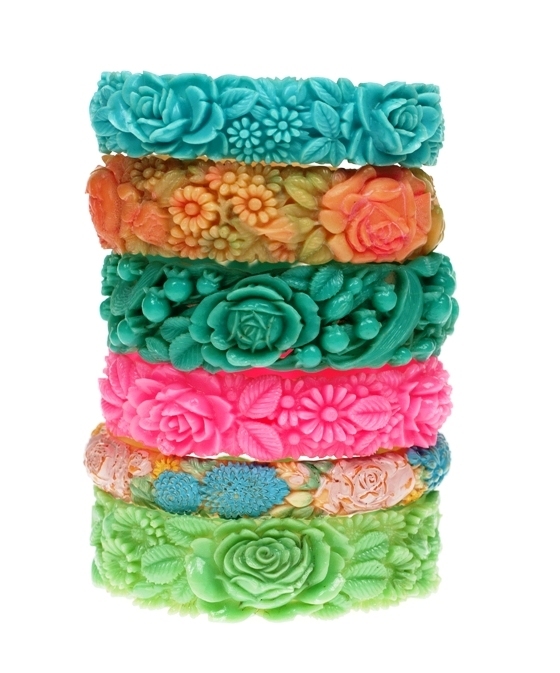 These wonderful bangles produced in Japan during the 1930’s are often marked Japan or Foreign. They were made in large numbers for export to America. Later pieces marked “Occupied Japan” were made for the export market from 1945 – 1952. The sale of these items helped Japan recover their economy after WWII. You can clean your lovely celluloid jewellery with an old soft toothbrush either dry or with a little warm water. 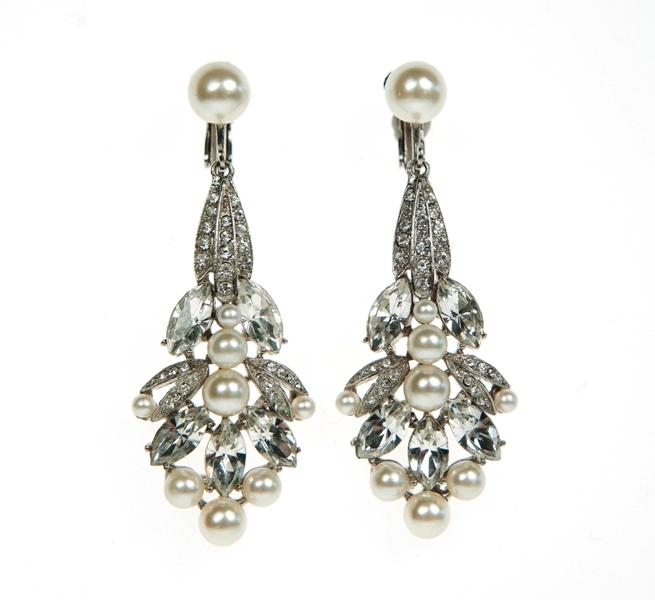 Remember to gently dry your jewellery after you have cleaned it and store it away from direct sunlight. Take extra care with hand painted celluloid items. It’s important to remember celluloid is affected by heat and solvents so never immerse it in hot water or spray it with perfume which can cause discolouration. If you would like to learn more about celluloid then this is an excellent book, Celluloid Collectors Reference and Value Guide by Keith Lauer & Julie Robinson.